Losing one or more of your teeth creates a gap in your smile, affects your ability to chew properly, and can alter your diet and nutrition. In addition to these serious issues, tooth loss also causes loss of jaw bone and facial support. 98% success rate – Highest out of any dental procedure! Avoids bone loss and gum recession associated with tooth loss. Restores proper chewing, leading to a better diet and improved teeth. Choosing a dental implant expert in Annapolis who has the verified training, education, and experience specific to dental implants is crucial. Dr. Djawdan is Board Certified by the American Board of Implantology/Implant Dentistry and is considered an expert in dental implant and sedation dentistry. We use advanced technology to offer our patients precision and accuracy in diagnosis and treatment. In 2004, we were one of the first dental practices in the world to have an in-office dental CT scan. With a dental CT scan and 3D imaging software, we can fully visualize the placement of the dental implant(s) in a real 3D environment and then design a surgical and restorative plan. The most important factor is the treatment planning with a vision of the end in mind. During your dental consultation at our clinic in Annapolis, we will obtain diagnostic imaging (3D, 2D and intraoral). Dr. Djawdan will review your medical & dental history to measure your risk and susceptibility to recurrent decay and or periodontal disease. He will use the CT scan and 3D imaging software to fully visualize the placement and restoration of your dental implant(s). If the tooth is already missing, we will use the CT scan and 3D imaging software to simulate placement of a dental implant with a crown to determine if the site has adequate bone to support the dental implant, we can proceed with placement of the dental implant. The dental implant typically requires two to three months to integrate before we can load it with a permanent restoration (abutment & crown). 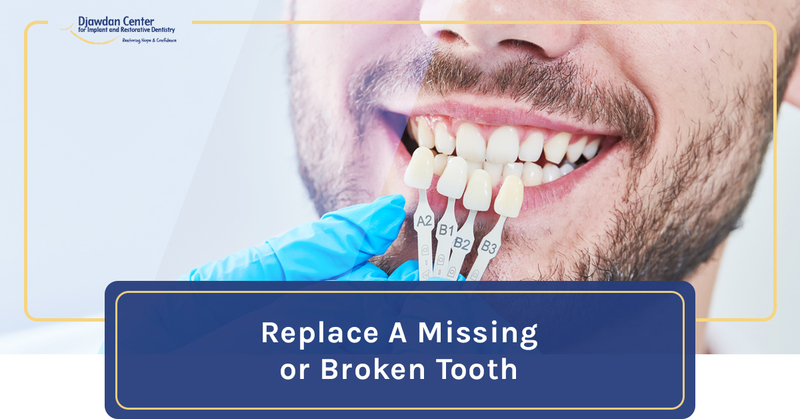 If you have a tooth that has a poor prognosis to treat and restore, with 3D imaging we can oftentimes plan to take the hopeless tooth and place a dental implant the same day. If the 3D imaging reveals inadequate bone to support a dental implant we can evaluate how much bone we need and what the prognosis would be to grow bone. We use some of the world’s most advanced technology to aid bone preparation and augmentation procedures. 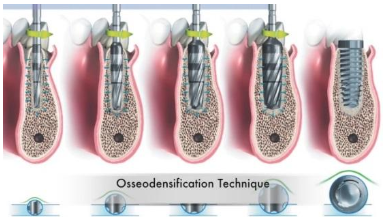 Densah™ Bur – “Osseodensification” is rotated at high speed in a reversed, non-cutting direction with steady external irrigation bone tissue bulk is preserved and simultaneously compacted and auto-grafted in outwardly expanding directions. L-PRF – Leukocyte-Platelet Rich Fibrin is a bioactive “band-aid” that is created from your own blood and then placed in your surgery sites to promote healing. When placed in surgery sites, L-PRF releases your body’s own natural healing proteins, creating a more efficient network for cells to enhance the healing process. Piezosurgery® Touch’s – micrometric cutting action provides ultimate surgical precision and intra-operative sensitivity, while the selective cutting action allows surgeons to cut bone while minimizing trauma to the soft tissues. If you have questions, please feel free to call us at 410-618-5966. If it’s after office hours you can email us by filling in the Have a Question contact form. If you are ready to schedule your judgment free consultation, please feel free to call or complete the request a consultation form.